My Thomas Patterson was not the man by the same name in Charleston District, St Bartholomew's Parish, SC in the 1790 census. Yesterday, while at the SC archives with Harald Reksten, I was able to PROVE completely that this Thomas was NOT my Thomas. He wrote his will in 1797 (Charleston Wills, Vol 27, pg 827), and it was proved in 1799 (Will Book C, pg 554). This Thomas only had one son, Thomas Patterson Jr. The William Patterson living with him was his nephew. His will identifies nephews William and Henry Patterson, and then identifies Charles and James Patterson, sons of Henry, and then also identifies a John Cornelius Patterson, son of William. This location was in Colleton District / County in 1800 and 1810 census years. Again, this was NOT my Thomas Patterson. I want to thank Harald Reksten for finding the recently published book (2005) titled Chasing the Frontier Scotch-Irish in America by Larry Hoefling. In this book the author shares information from the early days of a frontier church in Augusta Co Va, near modern day Harrisonburg, in the Shenandoah Valley. The church was Peaked Mountain Church, and "the list" presented by Hoefling shows baptisms and marriages from 1759 to 1764. My gggg-grandfather was John Patterson, born in 1765 in SC. He married Margaret Black in the 1780's. Around 2000 or 2001 we were able to connect John Patterson to his father, Thomas, who in turn was the son of Robert and Sarah Patterson of DE, VA and York Co SC. That said, we had never found a name for the wife of Thomas Patterson, who should have gotten married circa 1760-64, theoretically. This list contains the transcribed name of "Thomas Peterson". It is not uncommon to find our Thomas Patterson's last name spelled in various ways, such as Patterson, Paterson, Pattison, Petterson, Peterson, etc. Harald and I both scoured the other names throughout this document, and while there ARE names for the "other" Pattersons who were in Augusta Co Va at the time, the family associations were pretty distinct for the two apparently unrelated Patterson clans. "Our" Thomas Patterson is overwhelmingly documented in records with Harrisons, Cravens, Blacks, and other families, too, but primarily these three families. 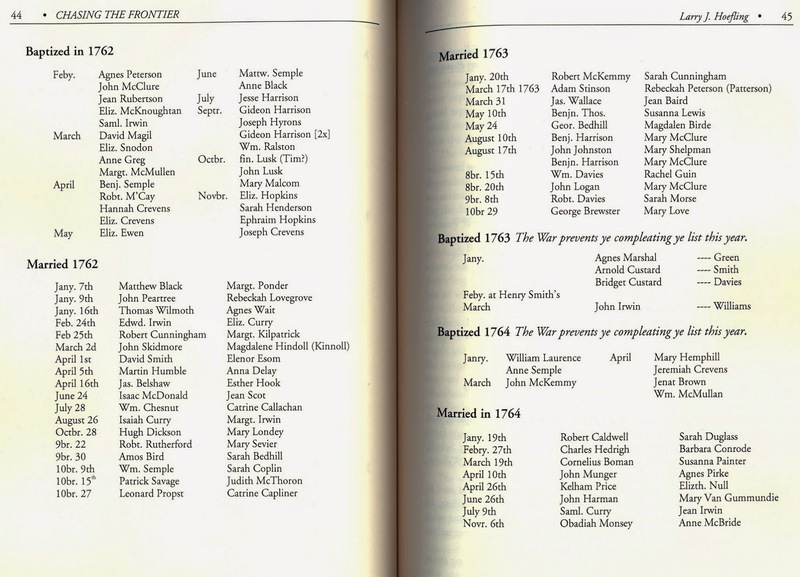 Furthermore, as you will see on the attached lists, many of those names mentioned above and others, are well documented to have moved to York Co SC and the surrounding area at the same time our Pattersons did, during the mid 1760's. Also, the Cravens names in this list were transcribed as "Crevens", not unlike Patterson being transcribed as "Peterson". I'm saying all that to say this... I am 100% convinced that Harald Reksten has just found the name of Thomas Patterson's wife, and my ggggg-grandmother. Her name was Margaret Harrison, and they married on 24 December 1761. You'll remember that in 1752 England and it's colonies officially transitioned from the Julian calendar to the Gregorian calendar - in theory, but not so quickly in practice. New Years Day was changed from March 25 to January 1, and a few other changes were made. But in practice, many people still thought of March as the 1st month, instead of the 3rd month. I mention that for this purpose. You'll see on this list below (the first one shows Thomas "Peterson" at the bottom right) that Thomas' marriage occurred on "10br. 24th" 1761. Huh? That was the writer's way of abbreviating December (10br), since in his mind December was the 10th month, and January and February were the 11th and 12th months. So the obvious question is, Who was Margaret Harrison? The quick answer is, I don't know. Long answer... there were many Harrisons in that region in 1761, but they were all from the Isaiah Harrison clan, so that narrows it down a lot. Isaiah Harrison (b 1666) died during the winter of 1737/38 when the family was migrating from Sussex Co DE to the Shenandoah Valley. He had seven sons and several daughters. The oldest son was Isaiah Jr. Another son Gideon, died in DE, but with issue, albeit not well documented. The other five sons were the ones who migrated to Va during 1737/38. They were Thomas, John, Jeremiah, Daniel and Samuel, the latter being the youngest, born circa 1712. The families of Thomas, John, Jeremiah and Daniel are fairly well documented. 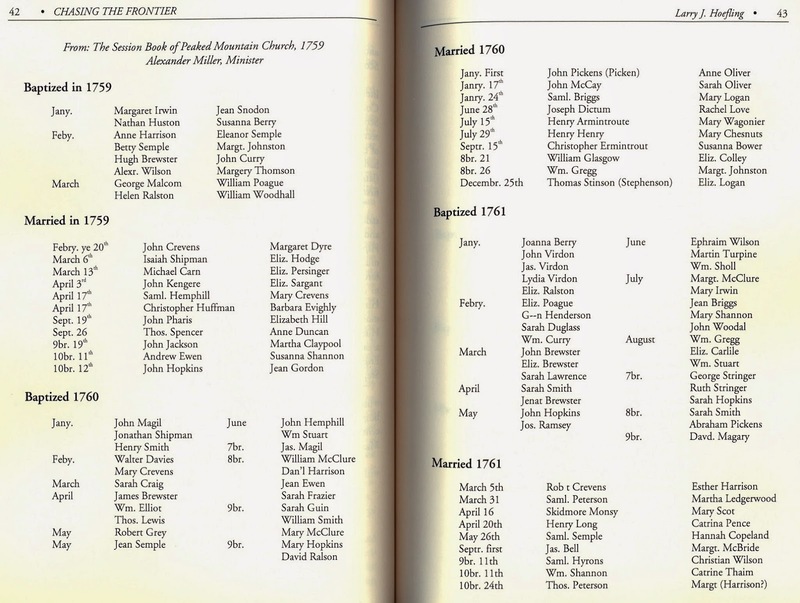 A few years ago I discovered that Jeremiah Harrison's first wife was actually Elizabeth Patterson, the aunt of Thomas Patterson. Isaiah Jr's family and Samuel's family are not so well documented. However, as the years have passed and the Internet has grown, more has been learned about both of these branches. It seems that Isaiah Jr and his family moved to Va during the 1740s and then promptly moved to the Yadkin River region of NC around 1750. Samuel on the other hand didn't move to the Carolinas until the early 1760s. It seems pretty certain now that Samuel Harrison and his family settled on the Lynches River region of what is now Lancaster Co SC. Samuel supposedly died there in 1790. The fact that Samuel and his family moved to SC in the early 1760s is a key fact to remember, in my opinion. Samuel Harrison lived near the Robert Patterson clan in Va, so Thomas Patterson and Samuel Harrison's children would have grown up around each other. More research is being done on the Samuel and Isaiah Harrison Jr families, but for now, it is safe to assume that Margaret Harrison Patterson was either a granddaughter or great-granddaughter of Isaiah Harrison Sr. The Harrisons are very well documented, even before Isaiah. More on this to come later. Again, thank you Harald Reksten for finding this information and passing it along. Us Thomas Patterson descendants are forever indebted to you for this.